Because I talked to some random guy in the market, I’ve somehow agreed to carry a barrel with his wife’s ashes into the city’s burial grounds. I don’t remember why he couldn’t do it himself, and I might have stopped listening as to the reason why in the middle of his woe-is-me story. Point is, there’s EXP at the end of this tunnel and possibly some silver, so of course I’m going to do it. Sidequests, AMIRITE? Once I reached the burial grounds, I set the barrel down where the handy quest marker shows me. However, there’s no ding to suggest I’ve completed this task. Nothing pops up on-screen, and in fact, the quest is still marked needing to bring the barrel to the burial grounds. Well, I’m at a complete loss. I try pushing the barrel, hitting the barrel, and I even attempt to set it on fire (I’m a fire mage, after all, this is what we do). Nothing. I tried switching to the Devourer demon in the Shadowrealm to see if he had any advice. He has a special Shadowrealm-only chest to open, but that’s it. In an attempt to exhaust all options, I switch to my archer, the soul puppet I recently acquired. He fires an arrow at the barrel, and it falls down in to the pit below. Huzzah, the sidequest is now complete! It was right in that moment that I realized I had stumbled onto something special with Shadows: Awakening. What I first thought was yet another Diablo III-esque action-RPG for me to review suddenly blossomed into something a bit more unique. 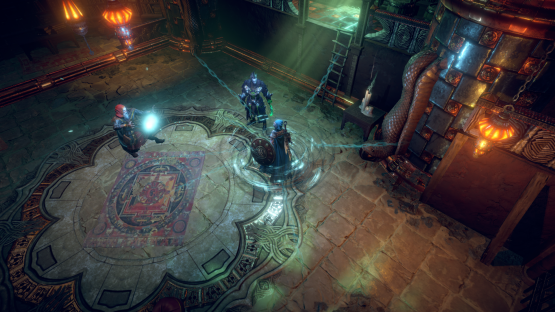 Sure, it still has that rather obvious Diablo III influence, but it also has a bit of Dungeon Siege III mixed in with puzzle-solving. I’ve sunk dozens of hours into one playthrough, and I’m already considering at least a couple more with different characters and different quest decisions. Most fans of this style of action-RPG will probably do the same. Shadows: Awakening unfolds with an old man (who is totes not Deckard Cain) summoning a Devourer demon to form a pact with. Yet, he’s not part of the pact. Instead, he offers to provide an unwitting soul for the demon to form this pact. Devourers take on souls of the deceased and wear them as a corporeal skin in the Mortal Realm. Demons themselves can only reside in the Shadowrealm, and thus they need a soul to be able to cross the veil. By forming a pact with a soul, the demon will possess that person and control everything about them. Since the Devourer is given a soul instead of making a pact with one, the soul becomes less a mindless puppet and more of that person born again. As such, this Devourer can, well, devour more than one soul and thus has plenty of puppets to play with. He also doesn’t have absolute control over his puppets the way a demon normally would with such a pact. Why does Old Man Krenze do any of this in the first place? Other than the fact it gives a fun excuse to jump between worlds, kill all the things, loot all the things, and explore all the things, there is a world to save. Long ago, a group of people banded together to tear down all religion in the Heretic Kingdoms, and they used this extremely powerful artifact to do so. Believe it or not, the power corrupted them and they’re on the brink of destroying both the Mortal Realm and the Shadowrealm. Who could have seen that one coming? Krenze figured that the only way to stop the end of the world was to get a demon involved—fight corruption with more corruption. But since a demon wouldn’t normally help anyone, what better way to get one to agree to help than by offering a way to devour several souls at once? The overall plot, admittedly, isn’t the best thing going for the game. It doesn’t help that it’s a bit convoluted and seems to heavily rely upon the player knowing the first game of the Heretic Kingdoms Saga, Kult: Heretic Kingdoms (also known as Heretic Kingdoms: The Inquisition). Thank goodness the character quests and sidequests fill any desire for more meaningful content that the overarching plot lacks. Sure, some sidequests are mere fetch quests, but plenty of quests have mysteries to solve or deeper insights into the Devourer’s soul puppets and the state of the Heretic Kingdoms. It’s these quests that kept me up late at night mumbling, “Just one more,” as I nodded off to sleep, cradling my controller. The player gets to choose between one of three souls for the Devourer at the outset: a fire mage, a barbarian/warrior, or a ranger/archer. Each soul has their own backstory and their own unique quests. Once the Devourer has chosen a soul, the others cannot be accessed for that particular playthrough. You’re already seeing the replayability options, aren’t you? There are plenty of other souls out there for the Devourer to take. Some are impossible to miss because they appear through story completion, and others are missable because you’ll only find them doing sidequests and/or via decisions you make. A loading screen even tells you that the path you walk on can determine finding a puppet. If you do miss one, the game is rather kind to let you know who you missed and where, you silly fool. The Devourer can swap between the various puppets at any time. However, the Devourer does not have access to all of the puppets he has collected. At Sanctuary points found in the Shadowrealm, players can switch out puppets for the three-person party. That said, your initial puppet has to stay in the party, and sometimes specific puppets must be in the party to progress questing. The game over screen appears when either all puppets or the Devourer have fallen. Puppet and Devourer health can both be restored via the Soulstone, which has a finite number of uses, as well as while resting. Whomever you are not using at that time will slowly regenerate health. As such, a bit of strategy comes into play when it comes to swapping the puppets in and out of gameplay. In addition, sometimes you must switch between the Devourer and a puppet to defeat an enemy or even a boss. For example, some enemies have shields that can only be taken down in the Shadowrealm. Some instances require stunning an enemy in the Shadowrealm so a puppet can defeat them in the Mortal Realm. Not to mention, sometimes you will need specific puppets to defeat various enemies. Your fingers will remain quite comfortably on the L1 and R1 buttons throughout your playthrough duration, to say the least. 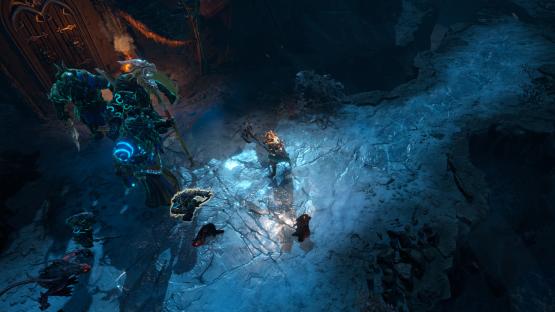 In a rather huge nod to Diablo III, the player can customize each puppet as they level up. With each level, the puppet receives five attribute points to assign to its Willpower, Attack, Endurance, and Agility. Each level also awards one Skill point, which can be used to learn new Skills and/or upgrade current Skills. Players can assign these Skills to specific buttons to activate and trade them out at any time (when not in combat). At specific levels, the puppet earns one of 20 passive Talents, and once again, they can pick which Talents best suit their playstyle. If you’ve played Diablo III for even a few minutes, you’ll be right at home with the character progression. All of that is fun, but the true purpose of puppet swapping is to solve puzzles. Remember how I said that your fingers will remain comfortable on the puppet swapping controls? When you come across a puzzle, switching between the Shadowrealm and Mortal Realm is downright required. Most of the puzzles are from the environment, requiring the player to solve them in order to reach somewhere or progress. Where the Devourer or your puppets go, the others also go in their parallel worlds. If an obstacle is blocking your way in the Mortal Realm, switch to the Shadowrealm and see if it’s still there or if there’s a clue on how to get past it. Most of the time, the obstacle won’t be there or a pathway will appear, bridging a gap. Move the Devourer across, switch back to the puppet, and voila! You’ve moved where you need to be. The puzzles aren’t always The Witness-level of challenging, but it doesn’t make solving them feel less satisfying. I got excited when I finally solved the very first puzzle of the game, as dumb as that may sound. Many of the main quest puzzles are soft lobs your way, but as for the puzzles off the beaten path, you may need some scrap paper for notes and your phone for taking pictures of the screen. 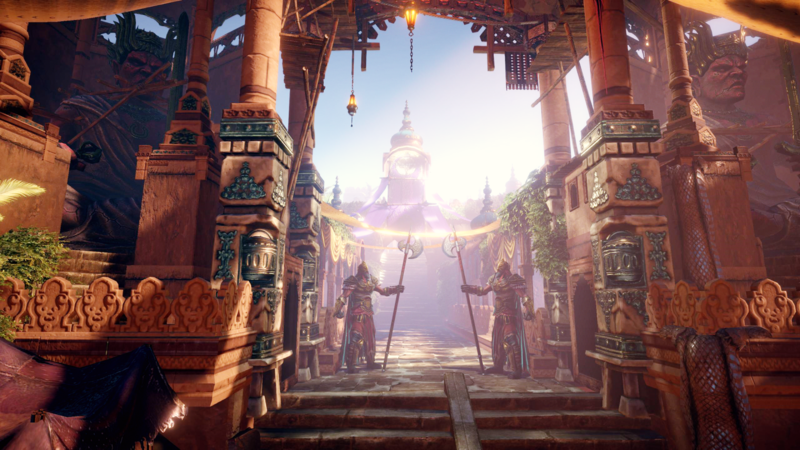 Many sidequests and chests are hidden behind these environmental puzzles in both the Mortal Realm and the Shadowrealm. Perhaps you’ll see a chest up on a pillar, but there’s no bridge. Switch to the Devourer, cross the gap, switch back to the puppet, and the loot is all yours. You might even find Shadowrealm chests along the way. More often than not, you will be thoroughly exploring each map in both realms for the loot possibilities alone, if not for puzzle clues. You never know what high level gear you’ll find, or, more importantly, which gear looks better on your character. It doesn’t matter how high the stats are, if the hat looks dumb, it’s not going to be worn. As much fun as Shadows: Awakening is with its hack-n-slash combat, a game crash will instantly sour the experience. The game auto-saves often, but it’s not always often enough when the game crashes. Unfortunately, the crashes didn’t start until after the 1.01 and 1.o2 version updates. It could be a coincidence, but regardless, it needs to be fixed. Crashing twice in the same hour is not pleasant for anyone. If those were the only two instances of crashing, I probably wouldn’t mention it at all, even though with one crash, I lost over an hour of exploring and looting. The load times, however, are fairly unforgivable. Every scene change takes a considerable time to load. It almost kills any desire to explore anything when going into a one-room shed creates a long load time followed by another long load time when leaving said shed. I can say that the long load times do inspire you to do your best to not die. Well, that and not remembering where your last auto-save/manual save was. Technical issues aside, I greatly enjoyed my time in the Heretic Kingdoms. The hack-n-slash combat with puppeteering strategies always felt fresh, the enemies always presented a challenge on the Normal difficulty, and I never got tired of the vast exploration and puzzle solving. Playing again is inevitable for me, as I’m really curious how much choices affect the puppets and the world around me. I played the goody-two-shoes route this time, by not making pacts with other demons and offering to help everyone under the sun. But I can’t help but wonder how differently the game would go if I played as Vlad the Heartless. How would that help me unlock puppets I missed this time? How would it change the already chaotic world? Does it have as many ending varieties as Dungeon Siege III? I also can’t help but wonder about the backstories for the other soul puppets I didn’t choose. With all of that replayability bubbling under the surface, it’s nigh impossible to not recommend Shadows: Awakening to all hack-n-slash RPG fans, especially those who never tire of the tried and true Diablo III formula. Shadows: Awakening review code provided by publisher. Version 1.02 reviewed on a Standard PlayStation 4. For more information on scoring please see our Review Policy here.